SANTIAGO, Apr 21 2015 (IPS) - Chile lives under the constant threat of spillage from tailings ponds, which became even more marked in late March after heavy rains fell in the desert region of Atacama leaving over two dozen people dead and missing and thousands without a home. 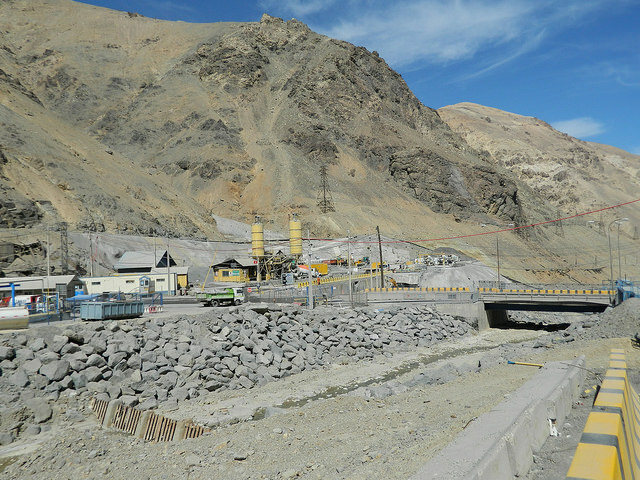 Copiapó, capital of the region of the same name, 800 km north of Santiago, is in an area full of tailings dams, Henry Jurgens, the founder of the non-governmental organisation Relaves (Tailings), told Tierramérica. In early April, the organisation detected tailings pond spills when it took water and mud samples in different parts of the Atacama region. But the government’s National Geology and Mining Service (Sernageomin) reported that the tailings impoundments that hold toxic waste are in stable condition. The Atacama desert, the world’s driest, was the main natural area affected by the flooding caused by the Mar. 23-24 heavy rainfall, which dropped the equivalent of one-quarter of a normal year’s precipitation on the area. Experts say the rain may have stirred up heavy metals lying quietly in abandoned ponds. Tailings, the materials left over after valuable minerals are separated from ore, contain water, chemicals and heavy metals such as cyanide, arsenic, zinc and mercury, deposited in open-air ponds or impoundments. These toxic substances build up in the body and cause serious health problems. Arsenic, for example, has no color, odor or taste, which makes it undetectable by people who consume it. Experts warn that long-term exposure to high levels of arsenic in drinking water can cause cancer of the skin, lungs or bladder. The main source of wealth in this mining country is copper. In 2014 alone, this country of 17.5 million people produced 5.7 billion tons of copper, 31.2 percent of the world total. But for each ton of fine copper produced, 100 tons of soil with toxic by-products must be removed and stored. There are 449 identified tailings ponds in this country, according to official figures. But there are dozens of others that have not been “georeferenced,” another member of Relaves, Raimundo Gómez, complained to Tierramérica. 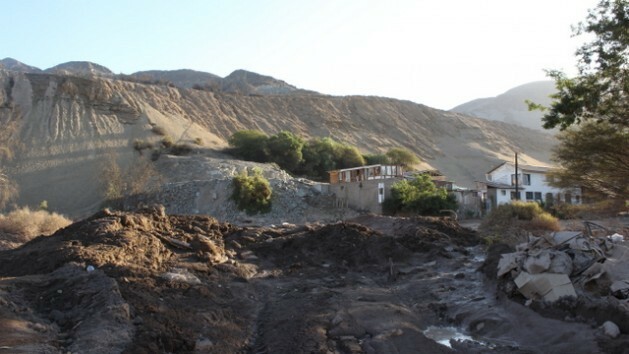 The earthquake that shook Chile on Feb. 27, 2010 caused the collapse of an abandoned tailings pile that buried an entire family under tons of toxic sludge. The victims, a couple and their two children, worked on the farm where Jurgens and his family lived for six years near the southern town of Pencahue, unaware that they were living next to a toxic, unstable tailings pile. “It wasn’t till then that I found out what it was, and all the things that could happen,” he said. “People are totally ignorant about this. They’re often drinking polluted water and aren’t warned by the relevant institutions….That’s just humiliating and terrible,” Jurgens said. Although experts say the worst risk is posed by abandoned tailings dumps, the ones that are still in use can also be dangerous. That is the case of Caimanes, a town of 1,000 located near the El Mauro tailings dam of the company Los Pelambres, the sixth-largest copper producer in Chile, which belongs to the Luksic’s, the richest family in the country. El Mauro, which in the Diaguita indigenous language means the place where the water spouts, is located eight km upriver from Caimanes. The seven km-long dam, with a wall 270 metres high, is the biggest chemical waste dump in Latin America. The dump has hurt the local biodiversity and polluted the water used by the people of the town. The main study on water pollution by tailings ponds, carried out in 2011 by Andrei Tchernitchin at the University of Chile, found high levels of heavy metals in a number of rivers. “At the Caimanes bridge, the iron level was 50 percent higher than the limit and the manganese sample was nearly double the level permitted for drinking water,” Tchernitchin told Tierramérica. He returned to take more samples for a second study, in February 2012. In a small pond, a few centimetres above a swamp, he found levels of manganese far above the internationally accepted limit. “The limit is 100 micrograms of manganese per litre, and we found 9,477 micrograms. The iron level was also 30 percent above the limit,” he said. He warned that if this severe level of pollution continued, the effects on the health of the local population would be serious. “Long-term exposure to manganese can cause diseases of the central nervous system such as psychosis, Parkinson’s disease and dementia,” Tchernitchin said. On Mar. 6, a local court accepted a lawsuit brought by the Caimanes Defence Committee on Dec. 19, 2008 and ordered the tailings pond to be removed. The mining company appealed, and the regional Appeals Court is to hand down a ruling shortly. Jurgens and Gómez called for a law on tailings that would indicate how many impoundments exist in the country, how many have been abandoned, and what chemicals they contain. “A strict law is needed, on one hand, and informed citizens on the other. We have neither of these,” Gómez argued. “It is really paradoxical that we consider ourselves a mining country and always talk about how much copper we’re going to export, but no one is aware of the amount of waste we’re going to produce,” he said. “We have to learn how to assess the negative aspects of mining and to raise awareness of that and of the large number of tailings ponds and waste that is literally dumped throughout the country,” he said. iron mining may not be necessary ! capitalism’s needs are to make money! without any concern for consequences, which are the responsibility of the local people who would be affected! The world simply doesn’t need more Iron Ore it needs replacements like Basalt fiber products. Basalt products can replace as much as 75 % of iron use world wide! Basalt is every where and more is coming up daily from deep in the earth. It’s only not used as much because of the economic power of large rip and tear corporations who want only to continue doing same O same O and paying dividends to the wealthiest people on earth so they can get even richer and have the power to override prro teope’s concerns world wide!